Restaurants are no longer places to feast, they are mini destinations where people come to enjoy the vibe, ambience, service and of course food. And, it’s really tough to have guests mesmerized, entertained, and satiated. Consequently, restaurant owners have to pull out all the stops to offer their guests value for money. Where some restaurants are simply the run of the mill types, quite a few of them have nailed it right. We bring to you our list of the 10 most impressive restaurants that have really worked hard to showcase some of the best creativity out there and enchant their customers with their concept and expertise. The simplistic décor, clean spaces and no frills interior gives this place a very live in the moment vibe. Guests frequenting this place find the ambience lively, energetic and charismatic. Overall, customers like coming in here to chill with friends and enjoy the peppiness of the place. If you want to experience the grandeur and orient charm of the bygone era, then you must visit Vintage Asia by JW Marriot in Kolkata. The restaurant interiors are an eclectic combination of the new and old, with crisp modern themes fused with rustic textured wooden moods. To add to the ambience, the décor includes interesting knick knacks sourced from the orient and strategically placed at several corners. The decor scheme has been deliberately designed to create a contemporary and cosmopolitan look rather than just restricting themselves to a classical Asian look. This restaurant in Powai that derives its name from the Japanese combination of words that signify sandwiches and honorifics is one of the most delectable places you can come across. Housed in a 2 storey space, it not only serves some scrumptious versions of sandwiches in different flavors like Asian, Indie, Italian, Mediterranean, Mexican and even Jain but also has a live bakery where breads are baked. But, apart from food, the place is vibrant with a lot of emphasis on natural light. The walls are adorned with photo frames related to baking, and one wall is bedecked with ladles. They also have an open kitchen format, which make the guests feel as if they are part of the cooking process. Sprinteriors is proud to have helmed this project and has successfully transformed the vision of its owner into a spectacle to behold. This restaurant is another representative of carrying tradition forward, however, blending it with modernity to appease the new age guest. This restaurant in Kolkata is replete with the legacy and heritage of its parent (Oberoi) and the interiors successfully create an ambience that has its root in tradition but has been draped with innovation, allowing an experience that befits a modern restaurant. As the name suggest, this restaurant in Hyderabad is royalty personified. It has been painstakingly renovated by Taj; however, they have aesthetically reserved the aura of the palace. The best time to witness the opulence of this place is after sundown, when the place is lit up by lights transforming it into a magical destination. The highlights of the interiors include 18 types of marble, 16 types of wood and 10 types of chandeliers. Staying true to the name-Falaknuma (mirror of the sky), the exterior color of the palace was touched up almost 100 times to make it perfectly match the color of the sky at dusk. You’ll find this restaurant tucked away amidst plush bungalows of Neelangarai on ECR. It is considered a clandestine jewel away from the hustle and bustle of the city and this along with its luxurious interiors and food is its biggest draws. It is an expansive property and the restaurant has an earthy feel and an inviting atmosphere such that it makes you feel at home. Even the color palette and materials used are elegant and simple radiating warmth and coziness. This all-day diner located in the buzzing area of Yari road, Andheri (Mumbai) is a sparkling confluence of rustic charm and quirkiness. The sky blue walls and other interior embellishments give this place a bright, busy, and chirpy feel. Also, the innovative interiors with its printed crockery and crooked shelves, strike your attention instantly. They also have a terrace, where you can catch up with your friends over a lazy brunch; and enjoy yourselves to some scrumptious dishes. Situated in Jodhpur-Rajasthan, this restaurant exudes luxury, comfort and class. The restaurant maintains an earthy feel as the designers have mostly used natural materials such as wood, stone, and linen and this has definitely contributed to the overall look. The dome shaped lined chairs near the windows offer a unique private space without being totally cut-off from the dining space. The color palette and materials used are elegant and simple and this makes the atmosphere fresh and inviting. 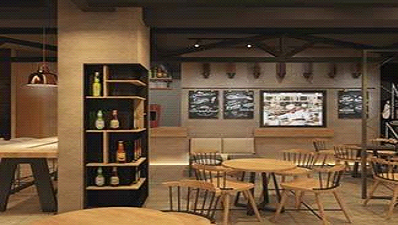 The restaurant interiors designed by Sprinteriors are very earthy and give a warm, inviting and aromatic feel to the space. The mix of elements and influences create a very nice, beautifully balanced and harmonized blend to the ambience which makes it open and inviting. The materials used are mainly organic wood in combination with glass and timber to create a warm and welcoming atmosphere while maintaining the simplicity of the décor.